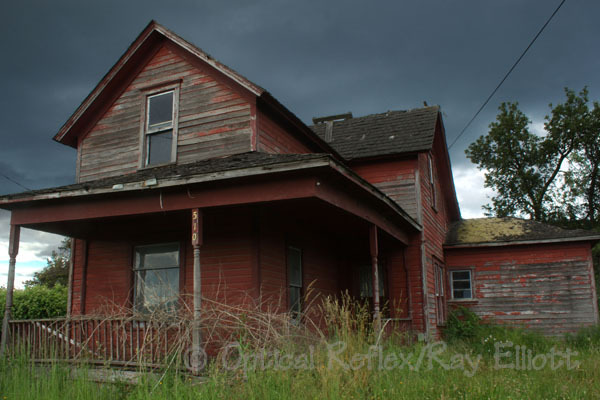 I don’t know why I developed a fascination with the Engfer farm; perhaps it was just something about the big red house at 510 S Washington Ave. that stood as a last bastion of a way of life as you entered the City of Orting. I actually drove past it for years, always wondering who lived there, then if someone still lived there and finally who had lived there. It wasn’t until June of 2012 that I stopped and really looked around. As is always the case with me and abandoned houses, (or cars, or trucks, or factories…. ), I wanted the house to speak to me—to tell me about its history and its people, but it remained mute, so I had to go looking for answers. I found some. Enough to paint a small picture. I never have met a member of the Engfer family nor had the opportunity to talk to them about their history but perhaps I will someday. Karl Engfer and his wife, Pauline (Arndt) Engfer Came to Orting in about 1903. Like many of Orting’s residents, they were of German descent, having migrated to the sugar cane fields of Hawaii for work and from there moved on to Orting; lots of work was advertised in Orting and by 1903 there was already a substantial German community there. They brought with them their children, Karl Jr., Minnie, John, Edith, Dora, Bertha, Margaruite/Margaret, Elizabeth, Ernest, Max and Erna. They were a busy couple. The house that has held my attention, as far as I can tell, was established in 1912 by Karl and Pauline, worked, and later leased, by the family. John took over from the lessees in 1932, presumably with his wife, Margret/Margaruite Deatry. John and Margaret had four children; Frederick, Minnie, Herman and Martin. According to the 1940 census, Margaret was 19 years younger than John and they lived with 4 ½ year old Fred. In an November 2000 article from goodthings.com, I found that Fred, Barbara and their son John were hard at work providing organic produce to the local are and while they weren’t a certified organic operation according to the article, “‘It is going to take a lot to convince me to use pesticides,’ says Fred. He does not like the idea of using poison on his food.” Apparently it was a great place for lady bugs to live and work. They sold to Associated Grocers for awhile, but doing so didn’t leave enough to go around for the local clientele, so they gave up AG and focused on the people they knew. In 2006 Eijiro Kawada wrote, in Tacoma’s New Tribune, that John Engfer and his mother, Barbara, were growing just enough for themselves and leasing the rest of the land for pumpkin growing. Fred had passed away in 2003 and they were hoping to keep the place open until their centennial year, 2012. It didn’t happen. For awhile, they leased part of the land to Chet Sidu, who came to America from Punjab, India in 1998 to farm. He grew raspberries there until it appeared the land would be sold in 2008. The deal didn’t go through, but by that time Mr. Sidu had pulled out all of his irrigation equipment and moved on. Orting, and many other small towns are hemmed in by the boundaries they agreed to in the Washington Growth Management Act of 1990. Since they can’t expand outside that area growth comes from paving over farm land. In the case of the Engfer land and the Gratzner land just north of it, it provides the only space for commercial growth for the city. Overwhelmed by the proliferation of houses, the City put a moratorium on them. “They want to see a mix of stores and offices on that land—and the tax revenue that comes with it,” Kawada wrote. And so, this year, the Engfer place came to an end. I was able to spend some time photographing what was left of the farm and present a gallery of some of those haunting photos. Meanwhile, my research continues on Orting, and the Engfer’s, and perhaps some other folks along the way. Check out more of my photography at Flickr.